In the course I am teaching on Motherhood this semester, we recently talked about Others who Mother. These are folks that do what we traditionally think of as mothering in lieu of a mother, perhaps because she is employed or perhaps for other reasons. We talked about extended family, nannies, and dads. Yes, dads. As I've touched on previously, we have different concepts for what it means to do mothering or fathering in this society. Fathering is typically viewed as something a DNA test can prove on bad daytime show. Mothering is mystical, magical, and natural. It is of the heart and soul. It is nurturing and beautiful. Though for most moms, dads, kids, and anyone watching families knows, this dichotomous view of parenting is overly simple and doesn't reflect the experiences of most people. But it makes for great jokes. Enter The Holderness Famly. I don't have anything against this fun-loving, parody-making family. They are just trying to make a go of the whole digital media thing like a lot of folks. Perhaps they are portraying their and others experiences. Making light of such experiences and bringing them to the fore of popular media and culture gives us a chance to address them thoughtfully. In Erin M. Rehel's “When Dad Stays Home Too: Paternity Leave, Gender, and Parenting” in a February 2014 academic journal called Gender & Society, she conducted research regarding the ways in which early patterns of baby care lead to long-term parenting roles played by parents. Rehel suggests that the culture of the family is established early on, and if dad is only given the opportunity to be a mother's helper and not have any actual responsibility with the baby and early duties associated with adapting to life with a baby, then this pattern will set up a family dynamic in which mom is responsible for the children (and likely most other household duties) and dad is simply her helper. This little cute-sy, giggly video with an attractive middle class family doing their sing-songy thing perfectly exemplifies a culture that has developed to see dad as a helper, though perhaps an incompetent one. This seems like an inadequate assessment of half the human race of males who can drive cars, hold down jobs, and memorize 30 years of sports stats for their fave team; they are not incompetant. Not only is it inequitable for mom, it is an insult to dad. He is capable of loading a dishwasher and folding laundry. In my class we also read a bit of Sara Ruddiick's Maternal Thinking (1995) and a recent piece by Andrea Doucet ("Taking of the Maternal Lens" in 21st Century Mothering) in which she considers her experience parenting as an opportunity to admire and critique Ruddick's classic text. She recaps Ruddick's most salient points, including that "men can and do mother." She discusses her own experience with co-parenting in which parents and especially other mothers looked at her husband at playdates and other such kid-centric activities with a “strange combination of suspicion and congratulatory amazement” (p171). She says that instead of assuming men can, do and should "mother," that we should see them as "re-defining and reconfiguring fathering" (p182). In an attempt at being equal parents, many men are navigating this field. And though The Holderness clan is clinging to an outdated model (though still fairly dominant in mainstream culture), there's a whole generation of dads who want to be actual co-parents, to share in the tasks and the responsibility of parenting. These dads, according to Rehel's subjects, even feel they wouldn't have missed the opportunity to take paternity leave and be a part of the process of creating family and a family culture. 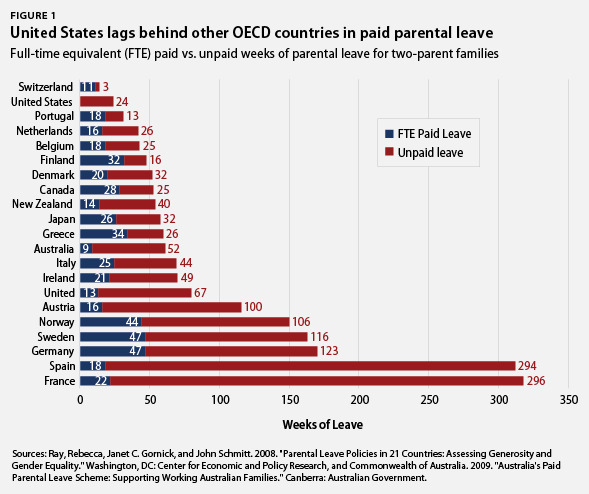 Of course, her paper is a critique of family leave policies in the United States. Such policies and federal laws create a culture that suggests men are not capable parents and therefore do need to be at home to help a new family develop. It is the Canadian subjects, who received paid paternity leave (as do many other developed countries), who were the ones who had these positive experiences at home with baby and mom. Because they were actually at home with baby and mom longer than a day or two. Because taking leave for fathers became the norm through federal legislation in Canada, the culture changed too. Dads can forge their own way, and it can include successful wiping of bottoms as well as of kitchen cabinets, all without having to be told that they should do so.